Pit Boss has gotten serious about producing high quality pellet grills and the newly introduced Pro Series models reflect the commitment. 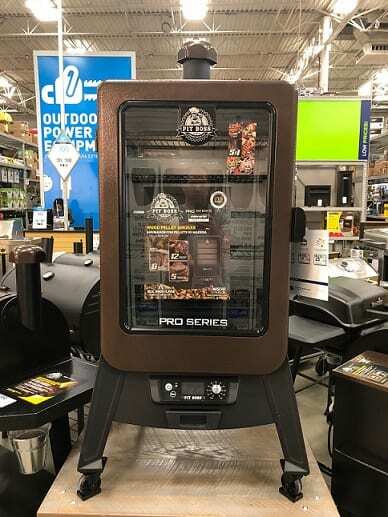 There are two Pro Series grills (models 820 and 1100), one vertical smoker (4 Series) and they are currently exclusively available at Lowes. One of the branding phrases that you find in the marketing materials for the Pro Series 820 and 1100 models is that they are the “Biggest, Hottest and Heaviest” grills available in their class. I have no idea if those claims are correct but I do know that this is a marked shift away from the previous strategy of simply being the cheapest pellet grill available. What Is Different About The Pro Series 820 and 1100 Pellet Grills? Pit Boss makes five or six different models based on the 820 and 1100 frames that are identical in function but have different cosmetic features. For example, if you wanted a Pit Boss the size of the Pro Series 1100 you could choose between that grill and the 1000 Traditions, 1000 SC, Rancher XL and the Austin XL. Pit Boss so many different versions of the same grill so a particular model can be exclusive to one of the Big Box stores. For example, the Pro Series 1100 is only available at Lowes while the Austin XL is only available at Wal Mart. It is a slick trick that the retailers are using to stop people from doing comparison price shopping. The Pro Series look and feel a little heavier than the rest of the Pit Boss pellet grills. The Pro Series 1100 weighs in at 180 pounds which is just a couple of more than the Austin XL (178 pounds) but quite a bit more than the 163 pound Rancher XL. I suspect that most of the weight difference comes from the heavy duty diamond hatch cooking grates that come with the Pro Series. This is a porcelain enameled steel grate and it is pretty beefy. I have mixed feelings about the new cooking grate. On the plus side I give Pit Boss much credit for going with a thicker, longer lasting grate. This grate is going to last. On the flip side, diamond hatch grates are, in general, a pain to clean. With the old simple rod grate you could hit it with a brush and then wipe the rods down with paper towels. The diamond hatch creates many, many more edges and corners for grill gunk to get stuck to. Overall though the grate is a big improvement. The Pro Series is, in my opinion, the best looking of all of the Pit Boss grills. It has the same general copper color as the Austin XL but with more of a hammered steel texture. The grill has a front mounted collapsible work shelf with some cool looking stenciling as well as some useful tool hooks. The other major feature exclusive to the Pro Series is the addition of a Simple Slide for the flame broiler shield. Almost all of the Pit Boss pellet grills have the ability to flame broil by sliding back a portion of the heat shield that is directly above the burn pot. The problem has been that sliding the heat shield was a pain in the neck since you had to use a pair of tongs to reach between the grates and manually push the thing. The Pro Series now has a lever located under the side shelf that you can simply pull back and forth to move the heat shield as needed. This is a simple but very nice upgrade. Overall these are solid, affordable grills with plenty of size. Control Panel: Dial temperature settings in 25 degree increments. Digital display for grill temperature and included meat thermometer. 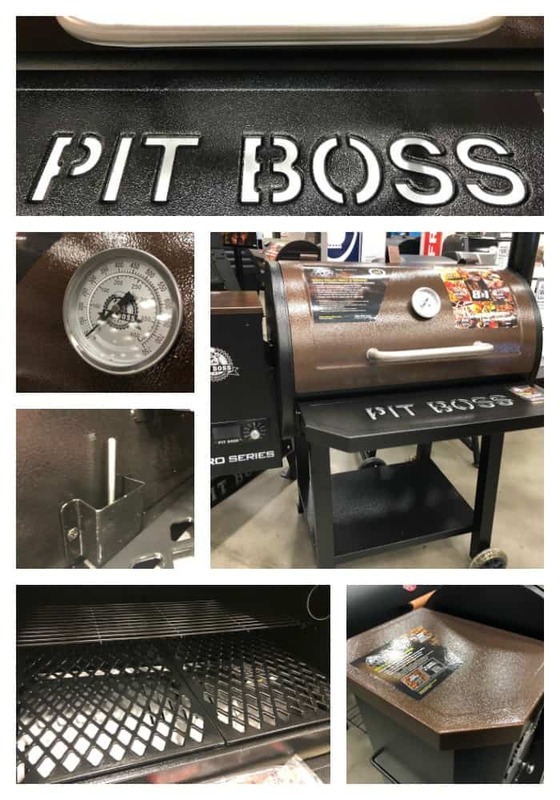 I like the Pit Boss Pro Series and do not have any complaints about the grills. 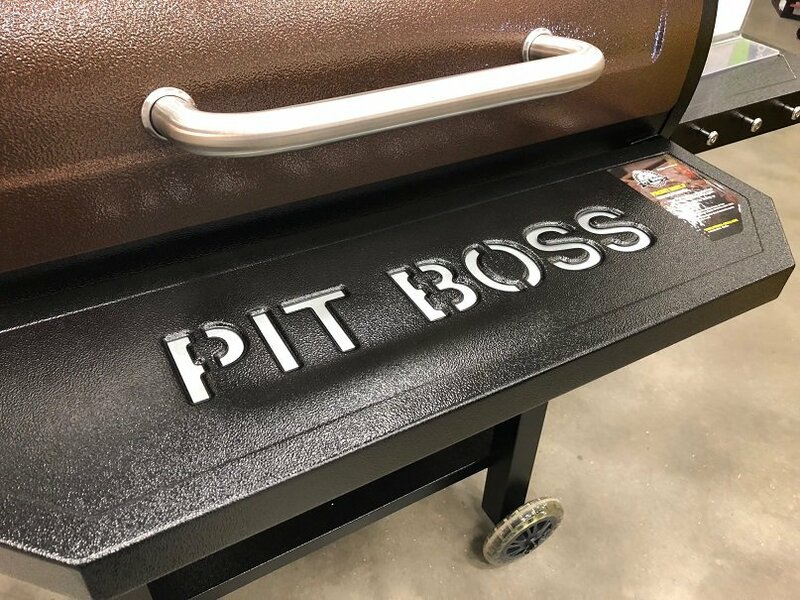 I would absolutely but a Pit Boss instead of an over priced Traeger any day of the week. What is Different About the Pro Series 4 Vertical Smoker? Other than size, not much. Pit Boss currently makes four sizes of vertical pellet smokers. The different smokers are the Series 3, Series 5, Series 7 and a Whiskey Still. Forgetting about the gimmick Whiskey Still, the only real difference between any of these smokers is size. The Pro Series 4 fits nicely in line with five grates offering 1,322 square inches of smoking capacity. The only concern I have is mobility. I don’t have an outdoor kitchen area and have to roll my smoker in and out of the garage. The vertical smoker does have wheels but I don’t think it would be easy to move if I had to get it back into the garage in a hurry like when an unexpected storm blows through. The Pit Boss also has a longer warranty (5 vs 3 years). I am also pretty sure that Pit Boss will be around in 5 years to honor the warranty…I am not so sure about Z grills. I see that the unit at Lowe’s is only 250 watts. The others are around 1500. Does this concern you? What will be the effect? Ralph, I believe the 1500 watt smokers that you saw are ELECTRIC smokers that use an electric heating element to generate heat. The Pro Series is a PELLET smoker that uses wood pellets to generate heat. The pellet smoker only needs enough wattage for the auger to transport the wood pellets to the fire pot. 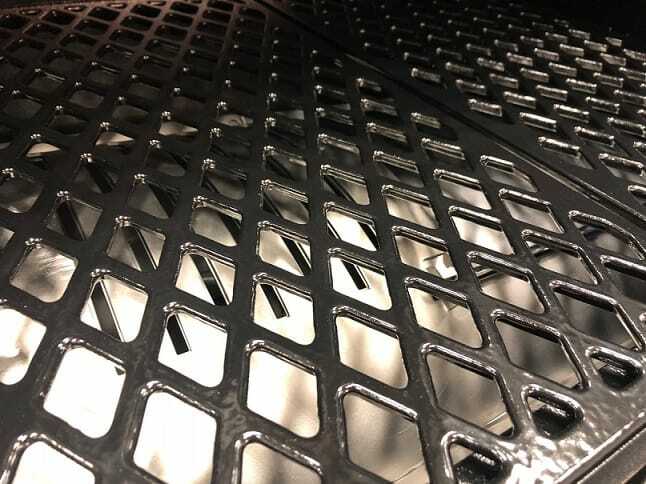 Heavy duty cross hatch grates that will last longer than the thin rod grate on the Austin. A side lever under the side table to move the flame broiler shield. You have to move the shield on the Austin with your grill tongs. A folding front shelf table offering lots of working space. There is no front shelf table on the Austin. A built in digital meat probe. There is no digital meat probe on the Austin. The shield side lever is not offered on the 820 nor or the front caster wheels. These two things caused me to go with the 1100 instead of the 820. The 820 also doesn’t have the hopper window plus it has a smaller hopper and I believe it only comes with one meat probe. There are two probes on both. I saw them when I was at the store, yesterday. Can someone tell me if you can ONLY increase temperature in 25° increments or is that just what’s on the dial? Most of the other pellet grills are around 5° increments. I’m debating between this and the Camp Chef PG24 DLX. Anyone see a reason to go one way or another? Quality is a little more of a priority to me. Yes, they can only move in 25 degree increments. The guy at Lowe’s told me it only had one probe and the Pit Boss website states it only has one probe included but it does have a place for two probes. A negative is that they only move in 25 degree increments up to 250 and after that it moves in 50 degree increments. I debated the same two as you Craig before settling on the Pit Boss 1100, I also was considering a Grilla Silverbac but it was too expensive. Some reasons include the Pit Boss was available at the local Lowe’s and has a 30 day money back option. It’s also bigger. The main thing I liked about the Camp Chef was the clean out. I’ve only done two cooks with the Pit Boss but I’ve been happy with it. I’m glad I went with the 1100 because the front wheels make it a lot easier to move around.